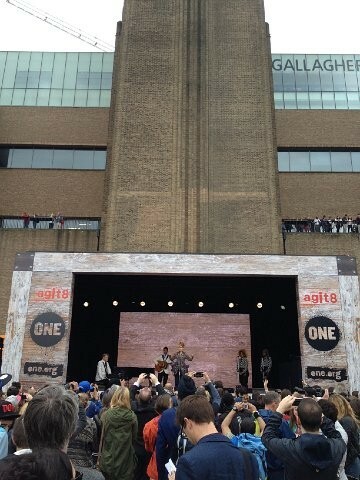 For three days in June, London’s Tate Modern gallery hosted the launch of anti-poverty charity ONE’s Agit8 project, where established acts including Tom Jones, Jools Holland, KT Tunstall, Jamie Cullum, Paloma Faith, Jessie J and Biffy Clyro performed on an outdoor stage alongside buskers, actors and up-and-coming artists. Capital Sound provided the audio system for the event and ensured that the sound of protest never clashed with the sound of Shakespeare. Agit8 is a music-based campaign, timed to raise awareness for action against poverty before the Enniskillen G8 conference - which took place on 17th-18th June - and beyond. The Tate Modern event saw the many artists playing classic protest songs to try and inspire a new generation to take action. Capital supplied a Meyer Mica ground stacked PA, with DiGiCo SD9 console at Front of House and a Yamaha M7CL on monitors. With the event running from noon to 9pm, one of the biggest challenges was posed by the nearby Globe Theatre, which stages spoken word matinees at 2.30pm. "We conducted some noise tests about a month before the event, which showed that we’d be fine if the wind was blowing from the east, but we may have problems if it was blowing from the west. So we worked closely with the Globe, agreed on levels that would work for both sides and it worked out very well," says Capital Sound’s Paul Timmins. "Another challenge was the wide diversity of acts and, as it wasn’t an advertised event, many of the audience were passers by. We had to keep things moving, going from one act straight into another to keep people’s interest." After the live performances had finished, the event concluded with an outdoor screening of a film on protest music and its role in social movements, directed by award winning writer and director Richard Curtis. Projected on to the Tate Modern building from Front of House, Capital supplied the sound reinforcement for this fitting conclusion to the event. "It was an absolute pleasure to work with Paul and all the team at Capital Sound," says organiser Mark Pinder of Mark Pinder Management. "The company’s professionalism, advice and the help that was offered throughout the build and for the three days of shows, featuring so many different performers, was second to none."